We are Providers in Seperators. Our firm is highly praised by consumers for offering Moisture Separators. This separator is quality tested by engineers on many steps of quality. Best quality tested material is used for making of these separators to let users have best products from us. Additionally, experts supply these products in market in safe form. Enlisted amongst the praiseworthy names of the industry, we are affianced in offering an impeccable range of Industrial Moisture Separator to our customers. C I and C S Moisture Separators W J Neta / Spriex Make, Size/Dimension: 2 " TO 8"
Size/Dimension: 2 " TO 8"
Keeping in mind diverse requirements of the clients, we are offering a quality tested array of Moisture Separators. 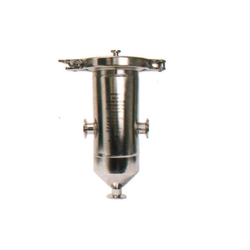 The Moisture Separators we offer is widely demanded amongst the clients for their precise use. Besides, we assure our clients that a quality tested array is delivered from our end. Moisture Separators are used to separate the moisture from the Air in Compressors and other Process Engineering Equipment.Moisture Separators along with water cooled intercoolers and aftercoolers are manufactured and supplied by us as OEM to many of our esteemed customers.